One problem with healthcare is that patients – and often doctors – don’t know what medical testing costs. Take Winn-Dixie, for example. After you read this blog entry, surf on over to http://www.winndixie.com/Health/Health_Wellness.asp for a list of screening blood tests with prices available through their pharmacies. To start with, they offer FREE cholesterol and diabetes screening at their pharmacies. Additionally, they offer several panels of blood tests at reduced pricing. A “Wellness Panel” costs $105 for women or $125 for men. (The female panel contains a thyroid test whereas the male panel includes a prostate test.) A cholesterol profile is $65. These charges are considerably less than at a healthcare facility. The accuracy of such testing may not reach the standards of a medical laboratory, but for screening purposes, it is probably adequate. Of course, understanding test results is another question entirely, and the immediate usefulness of certain tests is questionable. For instance, Winn-Dixie offers a C-reactive protein for $65, a test which definitely requires physician interpretation. Likewise blood typing is available for $20, but unless you need a transfusion, there’s little reason to be tested, and no hospital is likely to take Winn-Dixie’s word for your blood type. If you do receive screening tests at Winn-Dixie or elsewhere, make a copy of your results and take it to your doctor. If the tests are all normal, the results are a good baseline reference to keep in your personal chart. If some tests are abnormal, your doctor can explain, and may want to order further testing. $50 x 10,000 = $500,000. 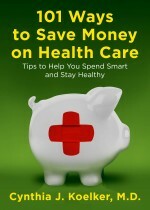 If you found this article helpful and want to learn another 100 ways to save money, check out 101 Ways to Save Money on Healthcare from your local library, or purchase at Amazon.com.